Turtle Bay is a place I associate with pre-gig cocktails and Highly Suspect excitement. I feel I need to explain that my excitement is not Highly Suspect, but rather they are one of my favourite bands who I happen to have seen a few times. Over-explanation over. They also have tremendous happy hours which means you are rarely without two cocktails in hand. I was recently invited to try the food, so thought I would give it a whirl. Now imagine the scene, I had been cooped like a chicken for a week after having minor death in the form of gastroenteritis. I needed spice in my life, and some post-quarantine fresh air. It was like the planets had aligned. We arrived on the wettest of days, the kind where your red ballet pumps are saturated within a few feet of walking, for example. Our chirpy waitress welcomed us in and quickly had a cocktail menu in our hands, and informed us that if she were to be an animal, she would most definitely be a loyal dog. Can't remember the context, but it went down well. 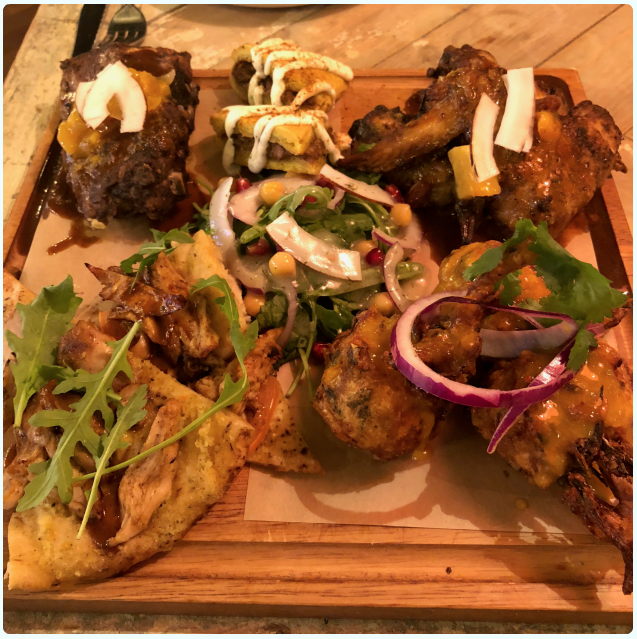 Just jerk platter - marinated jerk wings, glazed pork ribs, beef patty, jerk chicken flatbread, sweet corn fritters and super green salad: Massively indecisive when it came to starters, so we ordered a platter. Felt safe, but actually ended up ordering too much food, which is standard behaviour. Apologies for the strange orange glow on the photos, it's a very orange establishment! 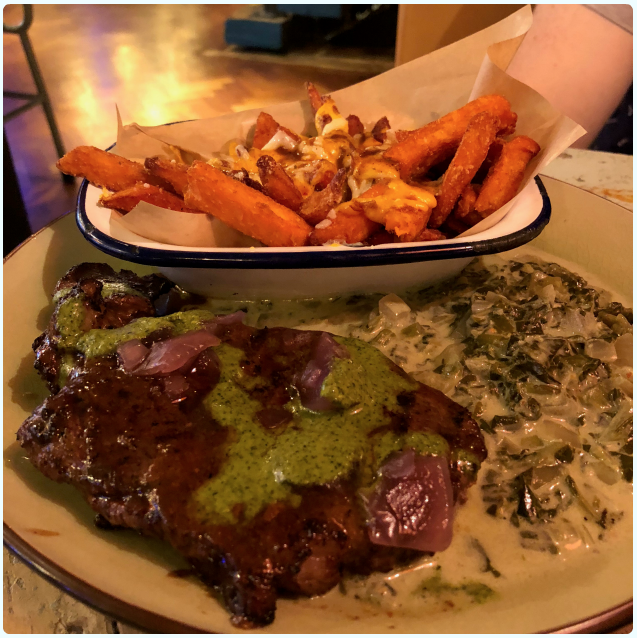 Jerk sirloin steak - Prime cut aged sirloin steak, spicy jerk, coconut callaloo and spiced fries: This picture is the equivalent of an intoxicated selfie after you looked a million dollars at the start of the evening. The steak was perfectly pink and the creamy coconut callaloo was the type of warming Autumnal fayre you crave in such dank conditions. 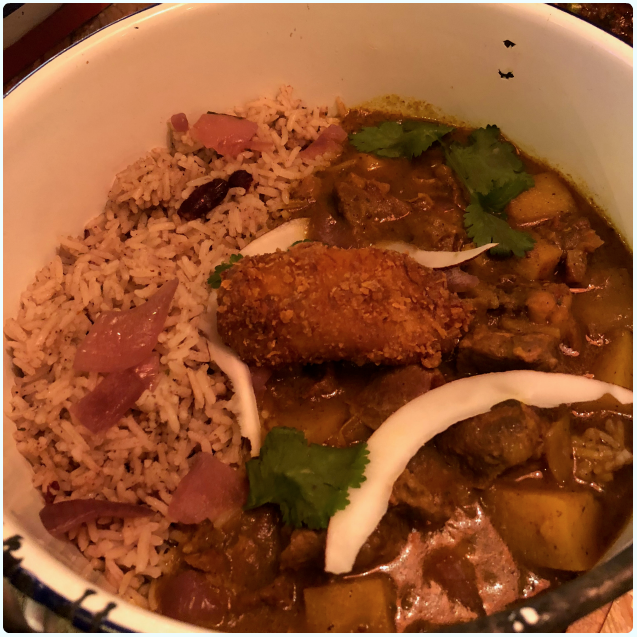 Goat curry - Rich and spicy curry, coconut rice ‘n’ peas, sweet plantain, dumplings: Two people recommended this within 24 hours. Had to be done. A fairly mild curry with a sweet edge. Proper comfort food. 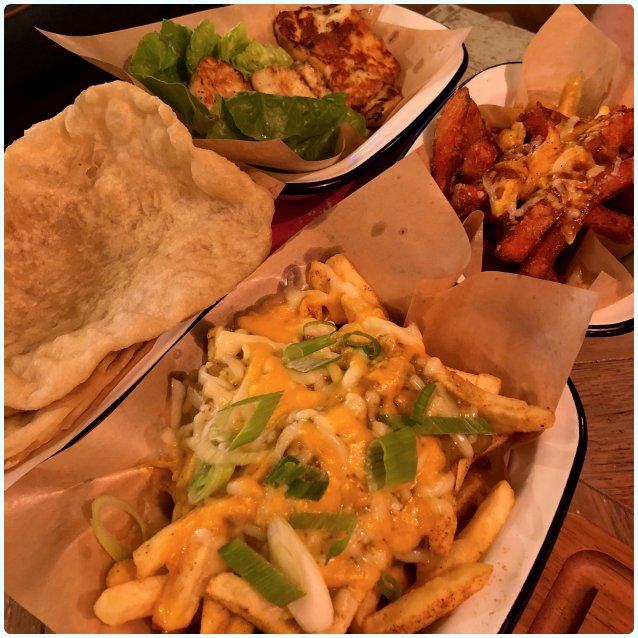 Sides - cheesy jerk sweet potato fries, grilled Halloumi, baba roti, and dirty curry fries: Judge all you like, we ordered too many carbs, and set it off with a side of cheese. We were being encouraged by the manager, who clearly shared my hosting mantra of 'they shall leave dying and unable to move owing to the volume of carbs'. Also, if Halloumi is on there, it's getting ordered. Jerk Halloumi is excellent. 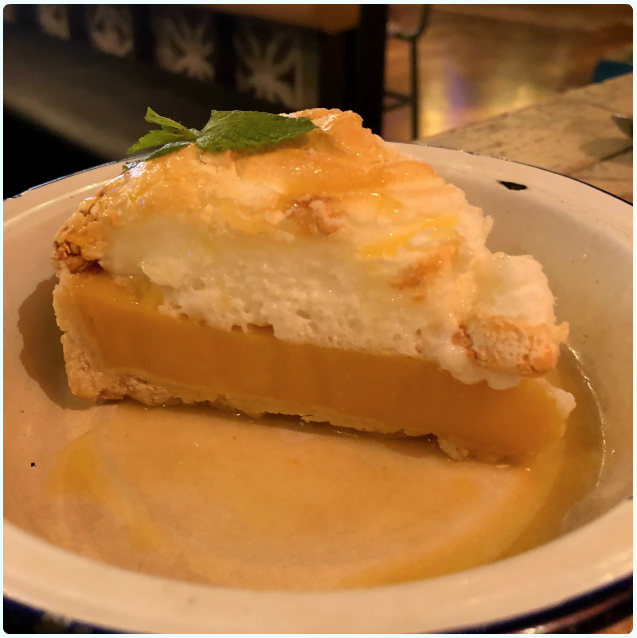 Passion pie - sweet pastry, zesty passion fruit curd, soft baked meringue, fresh passion fruit sauce: Of course I had room for dessert. My ideal kind of pie, this is like the lemon meringue variety but with passionfruit. Perfect. 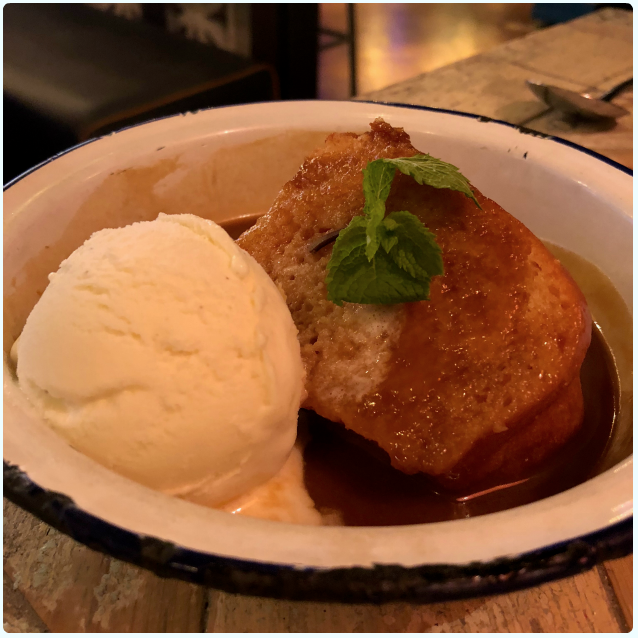 Caymanas upside down rum cake - warm golden mellow rum cake, rum caramel and vanilla ice-cream: Jeez Louise this was strong! Extra points for being baked bundt stylee, this light sponge was drenched in rum, which was just wonderful. Rather pleasant afternoon. By the time we left we had guffawed with our waitress, had a chat with the manager about the ludicrous nature of him emigrating from California to Manchester, drunk some lovely cocktails, and suffered near gout levels of fullness. We had even managed to miss the rest of the rain. Go here as a group for lots of buffet style food, for comforting one pots and grills, or just to take advantage of a great happy hour. 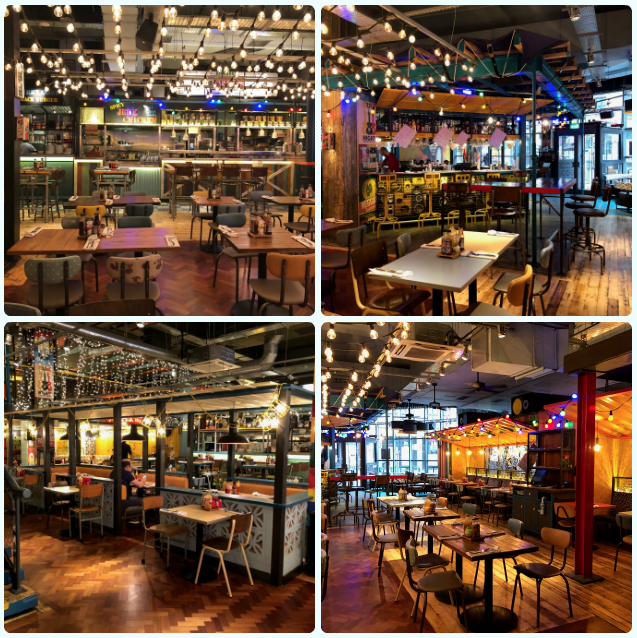 Disclaimer: I was invited to review Turtle Bay, but put under no duress when it came to the nice words bit. I wasn't even drunk, and neither was the waitress who likened herself to a friendly dog.